I‘m happy with this fruit still life series that I’ve started. Because I never painted fruit before, I started with those little ACEOs as training for larger paintings. Now I’m feeling quite confident on my skills of painting fruit…. 🙂 So that I painted this painting which is way much bigger than a tiny ACEO miniature art. 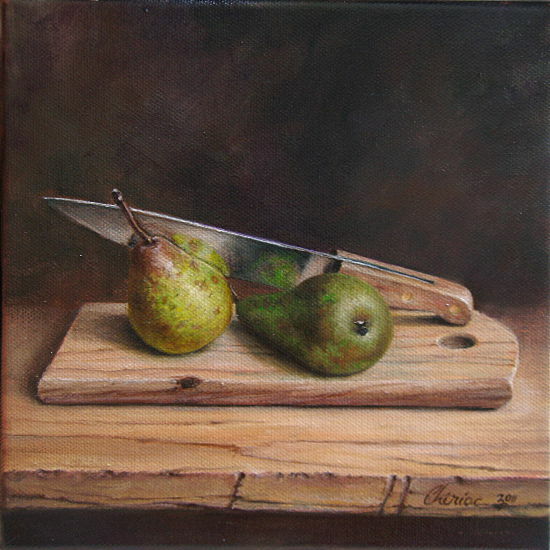 It is an oil on canvas painting depicting two pears on a woodcutter and a knife cutting them. It’s painted in the classical realism style. Some would say it almost photo realism but I say no, it’s not photo realism nor hyper realism but only classical realism. As I wrote on eBay chat board a couple of weeks ago, I want to paint a still life as good as a winner of the ArtRenewal.com contest. Yes! I intend to participate to the still life section of the 2012 contest . Until then, I practice to be better and better.